If you say Katharine was born on skis, you wouldn't be very far off. 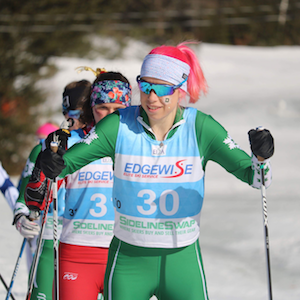 She started skiing with her father at age three, joined a youth ski program at age five, and has been racing every winter since. Pretty amazing to have 18 years of racing under your belt and you're only 21. But when you love something, the hard work and long training hours are worth it. And they pay off. Katharine already has a pair of Bronze medals from the 2017 Junior World Championships in skiathlon and relay. At the 2018 NCAA Championships, she won both the 5K classic race and the 15K skate by substantial margins, a feat, amazing within itself, and then add a little history? No American woman had one both races in 27 years. Pretty awesome. Not bad for a born and raised VT girl. She'll be racing for Dartmouth through 2021, but you can always find her in the mountains of VT, skiing, riding mountains bikes (yay! ), hiking, or simply enjoying a good garden party with friends and teammates or the occasional cinnamon Poptart.